It's very weird but I can't put any titles on my blog anymore! I finished another layout for Finding You somewhere last week. I still have to finish 2 layouts! I hope I will succeed next week. I want to give it a try this afternoon! Because I'm feeling so tired I'm not much inspired lately! 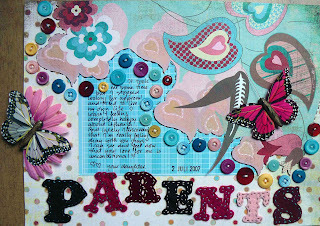 This layout is about Parents as you can see! Supplies: pp (BG and Elsie Flannigan), feltletters (homemade by me), buttons (market and Foof-a-la), pink flower (Zeeman), butterflies (Action), embroidering thread, black pen (pilot), datestamp (Dutch store), stazon ink.